For those who were asking… Here’s a quick photo of my Handi Quilter Sweet Sixteen overlay taped onto the table, using painters tape. I have the overlay for my S16 so I feel I can offer some thoughts from a position of having used it as versus looking at pictures on the internet and assuming I know what it does etc. It’s retail price in Australia was about $100 (I think it was $99). I don’t know what the price is in the US. Do I regret buying it? Not a bit! Do I use rulers? Hardly at all. Did I use the SupremeSlider? Yes, but I don’t now. Were my quilts getting ‘caught’ occasionally on the table? I didn’t think so, but since having the overlay they move much more smoothly over the surface and therefore under the needle. The overlay is not a laminate or melamine – I don’t know what it is, but it’s very smooth… much smoother than the SupremeSlider. I’ve also sprayed the overlay with silicone spray and that makes it doubly as smooth. Did I try various methods of lowering the height of the machine? Yes, but with little success (anything paper-based was going to squash down over time), and removing the rubber feet was awkward (though likely a one-off task). Why did I want to lower the machine (or raise the table)? Because there are two issues – one was that the machine base was just a tad too high (and this affects ruler work, but remember, I rarely use rulers); the other was that there’s a slight gap between the table and the machine as there has to be as the machine throat base is slightly curved and table is square. And sometimes a quilt gets caught in that gap. And lint gets caught in that gap. With the overlay, there’s NO GAP for anything to get caught in and the height difference between the machine and table is eliminated. Could HQ design a better match between the table and the machine? Perhaps. But from what I’ve been reading here, some people say the height is too high by 1/16 or 1/8 or ¼ an inch, while others say it’s too low by similar amounts. How does HQ deal with that? To be honest, I think the real problem that HQ have is with the rubber feet. If those feet come from the manufacturer in slightly different sizes or are screwed in slightly differently from one machine to another, then each machine will sit in the table in a slightly different way. If, for future purchasers, HQ raise the height of the table a tad, will it actually solve the problem if the problem is really with the height and setting of the rubber feet? And don’t forget that the feet may well compress a little over time, and you’d still end up with a height differential between the table and the machine again. Has anyone used one of these sit-down machines for 5 or 10 years – long enough to see if the feet compress over time? As far as the Tiara is concerned, I’ve only seen the same pictures/videos on the internet that people have shared over the past few days. And as someone who has the overlay, I can categorically state that all the pictures/videos of the Tiara I’ve seen ALL HAVE THE OVERLAY. Babylock have done nothing different with the table that I can see. One final thing about the overlay… My dealer advised me NOT to secure it permanently with the tape that’s supplied as she said it WILL tear the laminate on the table top if ever I wanted to take the overlay off. I followed her advice and have it secured with about 10 small strips of blue painter’s tape (see above), which I can add/remove at will – cheap, quick, easy. 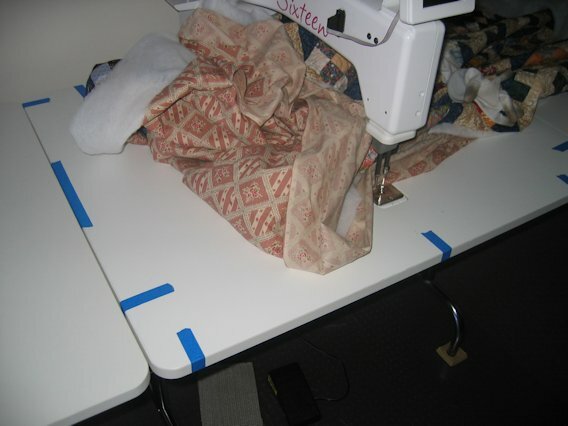 Though having used the overlay now, I would never go back to quilting on the ‘bare’ table. Remember, I don’t do ruler work but in my opinion the overlay is worth every cent I paid for it. And in my opinion it’s an optional extra (like in a car), just like the TruStitch is an optional extra. Rhonda, did you ever try out the Tiara? I am thinking about the Tiara and HQ but there is a big difference in the price of each Tiara is higher but dealer is 24mls closer to me. Not sure of the overlay situation on Tiara either. No, I didn’t try the Tiara. As far as I know, it isn’t sold in Australia. Babylock isn’t a big name here — I don’t think their sewing machines (other than overlockers) are sold here either. The Tiara is the HQ Sweet 16 rebadged. They are the same machine. And the same table, and therefore I expect the same overlay. So do you feel the Taira will perform as well as the HQ and even thou pricer the closer location for future help and problems would be the best bet . I only want to make this purchase once and I am 70 and at this time a mild quilter but if right machine I will get more involved. I don’ t mind the expense just not that will informed and trying my best to do so. I appreciate your help very much. It’s the same machine, Linda. My recommendation is always to buy from a dealer close to you who offers servicing, training, etc. In the long run, you’ll likely be better off than buying cheaper from someone a long way away who doesn’t offer servicing, repairs, and training. If you ever have to freight your machine, it will be an expensive exercise! I know I will have to pay more and feel your advise is well taken for I hate to drive far and will always be by myself. If you feel the machine Taira is compatible to HQ I will go for a test run tomorrow. I have heard such go reveiws on the company and want to make the right decision. Again thank you for you guildence and patiences. I’ve just bought a HQSweet16 and I’ve looked at a lot of videos on line, and I haven’t seen anybody quilting a big Queen/King quilt on it. I was wondering where do you start, in the center, or corner? I’ve sewn quilts on a regular machine with the extra fabric in the back (since the arm is facing sideways), but now that I’ll be “in front”, it seems confusing. Thanks! It depends on the quilt design and how I intend quilting it. For a big quilt, I’d baste it fairly well (I pin baste about 4″ apart), then possibly stitch in the ditch ‘every stinking seam’ (ESS; attributed to Cindy Needham) before starting the quilting. If I’m doing a continuous line overall design, then I’ll start in the middle and work out in larger and larger ‘circles’ from there. If it’s a traditional quilt with lots of various blocks, then I’ll load up with one colour thread and do all the blocks that need that colour, then load up another colour and do the blocks in that colour. Do you use the S16 to stitch in the ditch? Where I’m confused (I get my machine Fri), is I’m used to my fabric being rolled up on the inside right arm (where the machine is blocking it), and in back where the bulk is lying on my pullout cabinet. On my left is another table and my pullout drawer I add a board to it. (I do spray & pin baste). If I have a large roll blocked by the center of the machine from going behind it, it seems like a lot of the fabric or the other roll would be in my lap instead of resting on a table (I’m a new quilter). So, do I start from the front and have the biggest roll in the back, and keep rolling towards me, and then when I’m half way done, switch the placement by moving the back edge to the front? Instead of basting front to back, and I basting left to right? Thanks! Yes, I use the S16 to SID — either free or with my Line Tamer ruler if I want perfectly straight lines. I don’t roll the quilt at all — just fan or puddle it around the table and under the huge throat of the machine. If you’re getting the extension tables or have other extra tables to put alongside the S16’s table, they — along with the A16 table provided — will take the weight and bulk of the quilt. With the A16, you can pivot the quilt and turn it as you wish to keep the bulk on the table. No more fighting your quilt!!! Thanks so much for your help! I enjoy your site & u Aussies Rock!